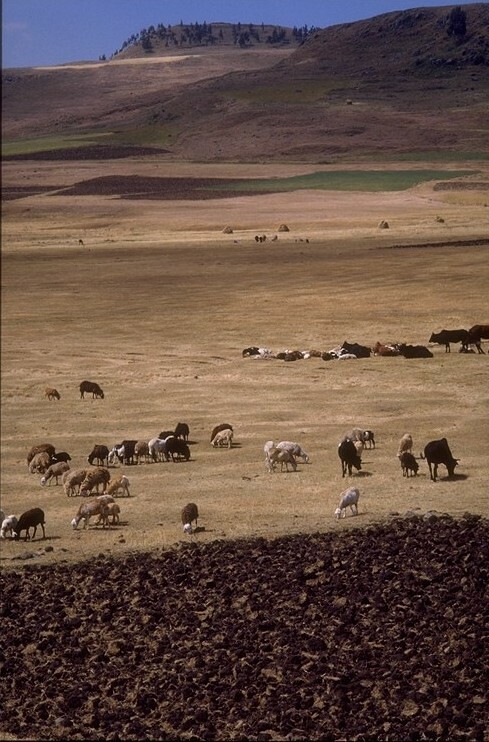 Typical rangeland of the Ethiopian highlands (Ethiopian rangeland (photo credit: ILRI/Dave Elsworth). ‘Understanding how climate change will affect rangelands is crucial as millions of people around the world depend on them for food and income. Now an innovative tool, going by the name G-Range, can help us simulate future changes that in turn supports climate adaptation. ‘We usually turn to computer simulation tools when we want to find out what our future climate will look like. For rangelands, which are natural landscapes in the form of grasslands, shrublands, woodlands, wetlands, and deserts, such tools are either for a specific part of the world or very complex, alternatively too simple. Seeing as rangelands support the livelihoods of millions of people around the world and make up about 45 percent of the world’s surface (excluding Antarctica), there is a definite need to find ways to simulate how climate change will affect these parts of the world as well. ‘Building on this need, scientists from Colorado State University have just put the final touches on an interesting tool called: G-Range. It’s a tool that can simulate generalized changes in rangelands through time, with simulations that may span a few to thousands of years. ‘The tool is easy to use, and represents all global rangelands in a single simulation. It can simulate the growth of herbs, shrubs, and trees, and the change in the proportions of these plant types. . . .
‘The tool is distributed with spatial data and settings that let the model simulate global rangelands. Users will likely want to make changes for their areas of interest, but the files that come with the tool will serve as a good starting point. . . .
‘Randall Boone and Rich Conant, researchers at Colorado University and leading the G-range project, joined with Dr. Jason Sircely, post-doctoral scientist with the International Livestock Research Institute (ILRI) and at the Natural Resource Ecology Laboratory, to conduct the sensitivity analyses. In this work, the agreement between model output and published spatial data was of most interest. . . . The CGIAR Research Program on Climate Change, Agriculture and Food Security (CCAFS) and the International Livestock Research Institute (ILRI) provided support to this tool. Read the whole article on the CCAFS Blog: New tool simulates how climate change will affect our rangelands, 22 Apr 2014. This story was put together by Cecilia Schubert, communications officer for the CCAFS Data & Tools team, together with Randall Boone and Rich Conant, research scientists at the Natural Resource Ecology Laboratory and faculty in the Department of Ecosystem Science and Sustainability at Colorado State University. Conant is a joint appointee with ILRI. Tags: Cecilia Schubert, Colorado State University, Jason Sircely, Randall Boone, Rich Conant. Bookmark the permalink.